Air and Nothingness Press | SPACE-BIFF! It’s been far too long since I’ve highlighted anything from my favorite print-and-play designer, Todd Sanders, whose games are consistently interesting, easy on the eyes, and completely free, provided your local library doesn’t charge for printing. The trick is to bring your own card stock and perform the ol’ Thurot eyebrows dance. I’ve yet to meet an octogenarian whose heart won’t go sticky as molasses once my eyebrows have had their way. Mmhm. Back on topic! Todd’s latest solo game is a ditty called The Court of Xiang Chi, about managing three different clans, navigating the intrigue of the court, and scoring as many points as possible. Oh, and also living in constant fear that those damnable Daemon Princes will show up and whisk away your ministers to serve the Daemon Court. Exactly like it happened in Real History. Staying up to date with all of Todd Sanders’ projects is functionally impossible — for reference, he’s already finished four games in 2015 alone, and we’re only halfway through the year’s second month. But it’s been a long while since we examined anything by one of the most prolific creators of free print-and-play projects, which means it’s high time we dive back in. This time, the game in question is Do Not Forsake Me (Oh My Darling), one of the winners of the BoardGameGeek 18-Card Minigame Contest. Yes, you read that right. 18 cards. 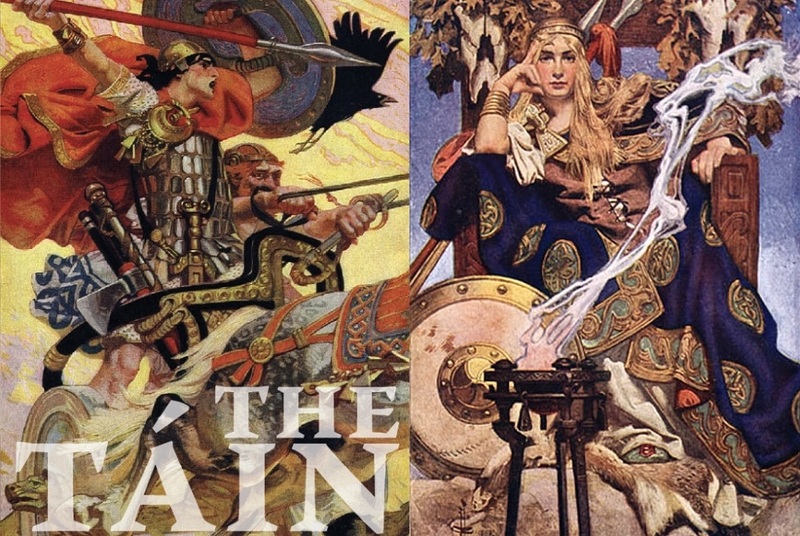 The Táin Bó Cúailnge is an epic story of early Irish literature about a battle between the Connacht Queen Medb, bent on stealing the bull Donn Cuailnge because she’s jealous of her husband Ailill’s bull Finnbhennach, and the hero Cuchulain, who’s the only dude in Ulster who isn’t sick with ces noínden, which should only last nine days but sticks around for months so Cuchulain’s antics can be even more amazing. Don’t ask me to pronounce the title or any of the characters’ names. And if you want to know more, I’m sure you can read Wikipedia articles every bit as well as I can. The Táin is the latest game from prolific print-and-play designer Todd Sanders, whose work we’ve examined many times before. This time he’s tackling the card-driven wargame genre, so let’s see if the game is more comprehensible than either of those bulls’ titles. Say one thing about Todd Sanders, say he’s prolific. Not only have we seen him tackle airship combat, fantasy sieges, space exploration, warring mages, the Silk Road, and more, now he’s gone and made a game about… um… letters and puns and… bees and… stuff. Well. I don’t know exactly how to classify LMNOP. Let’s find out together. Want to hear a secret I haven’t told anyone else ever? I think 4X games kind of drag. I mean, you’ve got to explore, expand, and exploit, and by the time we finally reach that point, I’m all, enough already, but then you’ve gotta go exterminate everyone too. I mean, sheesh! Alright, alright, put down those torches, you’ll make black spots on the ceiling. And anyway, I’m just being controversial to bait extra clicks. The real problem is that while I love 4X games, I rarely have enough time to get through the exploit part, let alone the meatier extermination bits. Once again, Todd Sanders leaps to the rescue, this time with Parsex — pardon me, Parsec X, which for the life of me I cannot pronounce or spell properly. Here’s a game that’s 4X, compact, free (to print yourself, anyway), and takes about 30 minutes to play. Oh, and even though you wouldn’t expect a 30-minute 4X game to be any good, this one is actually pretty respectable. It wouldn’t be a Tuesday in February without a look at another print-and-play title from Todd Sanders, or at least that’s what my grandma used to say once the dementia had really dug in its claws. Our previous features of Todd Sanders’ work have mostly focused on his solo and two-player efforts, but today our topic is They Who Were 8 — or They Who Were ∞, if you’re an altcodemancer — which is a four-player team-based microgame about a jealous pantheon of gods as they seduce, give birth to, and conflict with one another. Just another day at the Mount Olympus office for these guys. Over the last week, a few hundred of you wrote in to express your extreme disappointment that this most recent issue of Alone Time wasn’t about yet another Todd Sanders game. Thank you kindly for your ebullient correspondence. My only defense is that I’ve instead been playing some of Mr. Sanders’ two-player games, which don’t really fit the solo requirement of that series. Which is to be, ahem, solo. The good news is that I’ve recently wrapped up a few plays of Mage Clash, one of Todd’s more recent print-and-play projects, and I’m ready to tell all.